Sunday Evening Video: 2 Tone Ska Live! Our video this week is the feature-film documentary, Dance Craze: The Best of British Ska Live! Originally released in 1981 in selected UK cinemas and finally released on VHS in 1988. There has never been a commercial DVD release of this movie ever made, which is a great pity. Shot in 1980 at the height of the British Ska 2 Tone music scene, this film follows The Specials, Madness, Bad Manners, The Selecter, The (English) Beat and The Bodysnatchers around the UK, presenting them in concert. There are no interviews or much of an interview, just pure music, sort of like Radio Free Charleston, only with loads more ska. 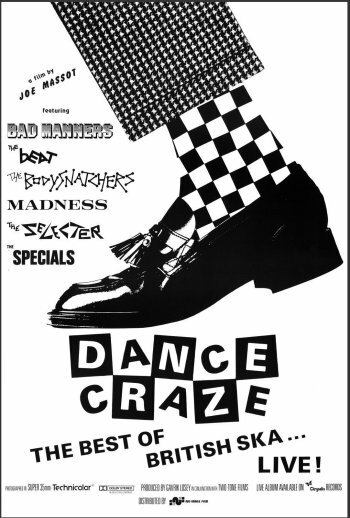 Dance craze was originally intended to be a documentary just about the band, Madness, but director, Joe Masot, became enamoured of the whole Ska scene, and changed his focus to include most of the 2 Tone family. 2 Tone was the record label started by The Specials to be a home to this great musical melting pot that was largely made up of biracial groups performing music that was part Jamaican, part American R&B and part Rock “n Roll. I don’t think this film ever had a theatrical run or commercial release in the US, but there was a soundtrack album (I have it in my collection) and it’s quite a treat to have a chance to see these performances on video. There are 26 different tunes performed by the bands, and it’s a remarkable snapshot that captures the excitement of one of the most vibrant music offshoots of the New Wave explosion of the late 1970s/early 1980s. Ska is one of my favorite musical styles, and I really hated losing the show, Ska Madness, from The AIR when its presenter, Dexter Checkers took ill, so this week’s Radio Free Charleston International will be a two-hour Ska extravaganza with new music from The Beat, The Specials, The English Beat, Madness and more. You can hear it Friday on The AIR.